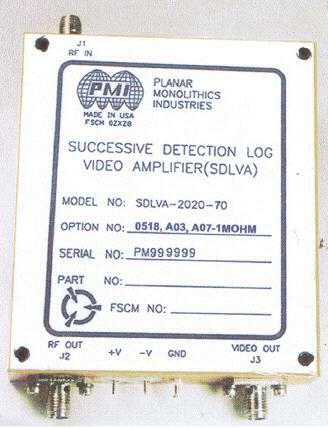 The SDLVA-2020-70 Options 0518, A03, A07-1MOHM is a truly DC-Coupled Successive Detection Log Video Amplifier (SDLVA) has a Dynamic Range of 70 dB over the 0.5 to 18 GHz Bandwidth, with true DC Coupling. Units employ Planar Diode Detectors and Integrated Video Circuitry for high speed performance and outstanding reliability. The SDLVA's are of superior construction using state-of-the-art hybrid MIC/MMIC Technology. The size is 3.5" x 3.0 " x 0.5". Size 3.0" x 3.5" x 0.5"